wondering why it failed in the first place. Same issue with 1.1.1. I have used the portable dumper a few times and have never seen this before. Old-style model; covered in first post. The good old blind dumper appears to work in QEMU (should work on all D4 and D5 models with bootflag enabled, except 7D). Make sure you have a valid image on the card, then go to PLAY mode. Split the dump in two, like you did on M2. Well that does look similar to what we were doing a year ago. Tried the "blind dumper" and it gave me a file named "As" that was apparently the ROM1.BIN and didn't need to be split. Disassembled it and it looks good. 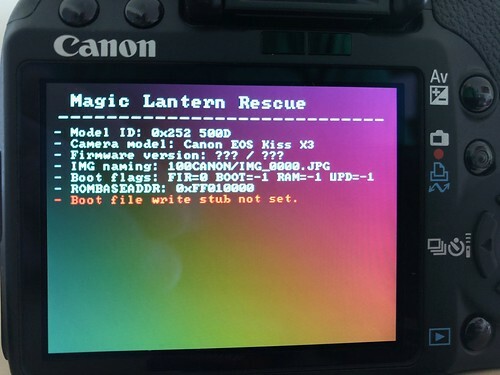 The issue: Canon's bootloader routines for file I/O copy the data to some cacheable (!) memory; when that buffer reaches 0x4000 bytes, it's written to card using DMA. The bug is, however, present in DIGIC 6 and earlier. - same portable binary loads on DIGIC 2, 3, 4, 5, 6, 7 AND 8! 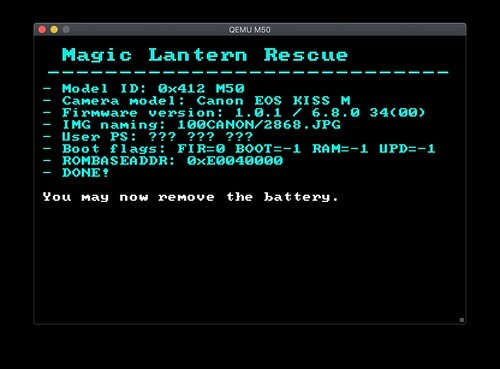 ROM dumpers ready for 200D, 77D, 6D2 and 800D; will post the FIR versions in the DIGIC 7 thread. These dumpers still require a very small card, but just formatting with a smaller filesystem will do the trick. The easiest way is (still) to write the QEMU SD image onto the card (howto). The issue can be reproduced in QEMU on a large SD image (or by running from a physical card), so it's clearly not a caching issue. It can be reproduced from the FROMUTILITY menu, without loading AUTOXEC.BIN (proof of concept and details available on request). I believe are two different issues in Canon code: writing from cacheable memory (fixed on D7) and large card support (still present on D7). sorry for the late reply... 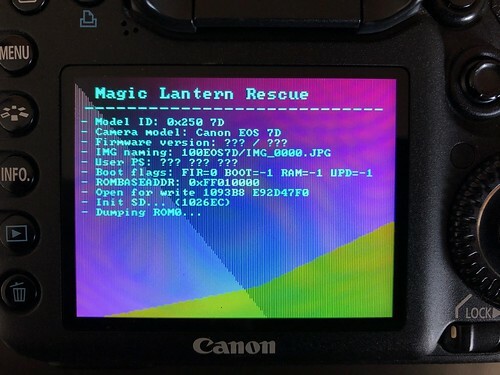 I've tried Portable Dumper on my 500D, same screen on booth firmware, even with low capacity card. @rafaelbf -- We need to use the blind dumper on the 500D. At first I had some issues splitting the dump in two but eventually figured it out. I have just ordered a 5Ds, which has D6+ like the 7D2, let me know if I can be of assistance, with testing and dumping. Had to tell it to dump to CF but it actually dumped to the SD. Updated with serial flash support for DIGIC 5 models (first post). Tested only in QEMU; please try and report back. Worked perfectly on the 700D and EOSM. All MD5 sums checked out. SFDATA.BIN looks valid. First time I tried it on a 32GB card and it didn't work but it was perfect with a 1GB card. The 7D didn't work no matter what size card I tried -- all the way down to an old 64MB CF card. It kept getting stuck on "Dumping ROM0..."
This note about the 7D probably still applies. The reason I looked up this topic was to ask a question about the 7D. Would it be possible to dump the master? When I worked on the 2.0.6 firmware update I used the display based dumper and I'm fine with that but would like to know if it is possible and if so I need some guidance on what addresses to dump. Then to figure out how to disassemble it. Would asking for a 1300D ML-SETUP.FIR in order to run this test be an unreasonable request? I have tried to find the issue of displaying Model Camera, Firmware version and IMG naming for models like 1300D. The prop_diag.c file returns camera information, specifically: Camera Model, Firmware version and IMG naming. But that file can also run offline, in the sense that you give it a ROM file from which it tries to find the information above. If you run it through autoexec, then he tries to find the camera software information. If you run it offline, then he reads the given file as a parameter and tries to find that information. To not compile portable.000 and run qemu, I chose to run it offline. Now that I can run offline, I can make changes to the software and try to see why that information is not available. check_terminator (0, last, 0).There is no information for Digic4 +. Maybe this feature needs to be changed for these device models? With autoexec, for Digic 7 and Digic 6, guess_prop is called differently, with other values than the rest. @critix helped get this running on my Mac. Needed to make a few changes. There is no information for Digic4 +. Right, here's what happens on the 1300D. - Firmware version: ??? / ??? [EDIT] Noticed that this is missing (from the 1300D branch too) though it isn't a solution to the Digic 4+ issue. The property data structures were changed a bit. 00099020: 0000ffff 02000001 0000002c 2e302e32  ........,...2.0. Yes, these offsets are changing at every camera startup, I think. There are a couple of property blocks with similar content, but only one of them is active (the one with the blue field 0000FFFF on most models; exception: M50, where the active block is marked with FFFFFFFF). Some of these property blocks are used by Canon for saving their settings (yes, they are reflashing the ROM at every shutdown), others appear to be fixed or possibly updated only on demand (e.g. calibration data or image capture configuration). As I was cleaning up the M50/SX70 dumper source in order to publish it, I've noticed the same method could be used for all models, starting with the good old 5D. I ended up spending the entire weekend reworking this. Previously, g3gg0 noticed the unreliability of Canon routines and tried to integrate a full-fledged FAT library (FullFAT), with some low-level SD driver written from scratch. For some reason, that low-level SD driver didn't work on my cameras, and since I wasn't able to understand its internals, I kept trying to debug the high-level Canon routines. Which worked, to some extent, on most of the models where they were present. On the M50/SX70, these routines were gone, so I had to find some other method. Would this work on real hardware? Let's find out! An older version of this code was confirmed to work on M50 and SX70. In QEMU, I've checked all EOS models from the test suite on the 256MB image (FAT16) and on a 8GB (FAT32) image. The only issue I could find was with 500D on the large image; figure out why. I didn't address caching issues yet (I just left them disabled), so the new dumper is not going to be very fast (at least not yet). Actually, the story begins somewhere around this, when I was trying to fix the emulation of various CPU info registers (i.e. sync the emulation with the logs posted by various users). As most of the CPU info logs were actually screenshots, I thought "OK, I'll get a plain-text log from the 5D3 real quick". 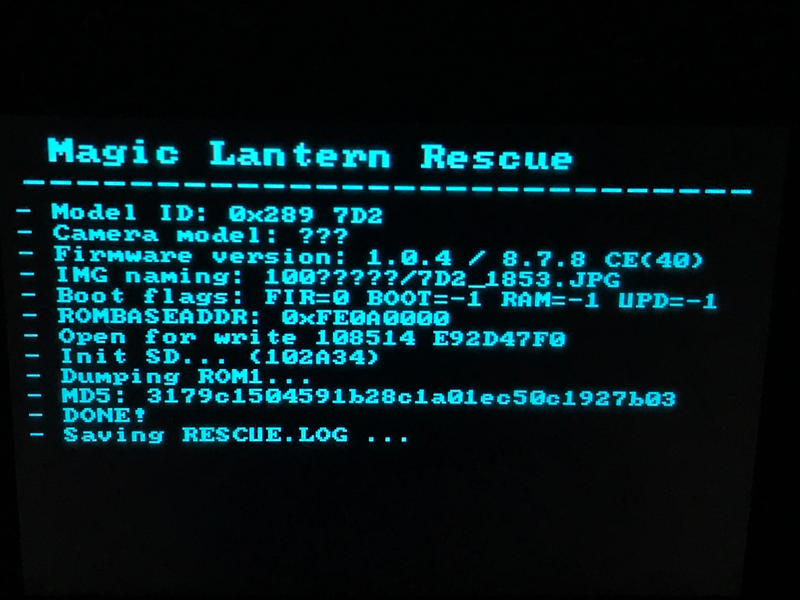 I took the camera out of the bag, compiled the portable codebase, enabled the CPUINFO functionality, made some small changes to save all that info to a log file, tested it in QEMU as usual, then ran it on the camera it without thinking too much. It seemed to work, but afterwards... the card went unreadable (and the camera did not boot any more from it either). The worst part - this was the moment I realized that card contained all my holiday photos! (as they were not downloaded yet). What happened? The QEMU image was a small 256MB one (which Canon's bootloader I/O routines have no trouble with), so my "offline" test worked fine. In the camera I had a 32GB card formatted as FAT32. Turns out, these I/O routines do not like large filesystems. At all. After imaging the raw card contents, I ran the same code on a good filesystem, to see exactly what kind of damage it did. Nearly the entire partition table was zeroed out! Both copies of the FAT! Luckily, the data area was largely unaffected. Needless to say - I've spent the next few days grepping the filesystem and writing custom file recovery scripts, as testdisk/photorec didn't work. In the end, I was able to recover nearly everything. Yes, all of this damage was done "just" by trying to save a small log file. This was my motivation for getting rid of these Canon I/O routines once for all. EOSM - MD5 on ROM0 didn't match. Tried multiple times with cards from 1 to 32GB. However, dump seems fine and it works in QEMU. ROM0 md5 issue not reproducible in QEMU. 7D (didn't work) screen blanks out after ROM0 md5. Tried with various sized cards from 32MB to 4GB. Saves ROM0.BIN but md5 checksum doesn't match. Also saves a partial ROM1.BIN. Can I please have a reminder on the testing process and I will test it on my 7D-1. and will advise the results. Alex, can you make the FIR file for those who do not have bootflag enabled? I want to test the 1300D. ROM0 MD5 not matching: expected, short answer in first post, will look up the long answer(s) later. 7D: that's actually big progress; IIRC it didn't even start. Now it was able to create a file, if I understand well. Maybe it's some supervisor (MPU? second core?) that's turning off the camera after some inactive time. The 5D3 does that after several seconds if you run the dumper with battery door open. Guess: maybe the dumper just needs to be faster? I've spent another couple of hours to track down caching issues. Updated autoexec.bin from previous post - is it still working? I've only tested on 5D3. Expecting it to be much faster. Sorry, have to run now, see you tonight. Busy day but I finally got a chance to give the new dumper on the 7D. Screen goes dark right away so I wasn't sure when it was finished. First time I didn't wait long enough but second time I just let it run for a couple minutes. Used a 512MB card. ROM0 md5 mismatch as expected but the dump looks good. [EDIT] Checked 700D, EOSM and EOSM2 -- only the EOSM is showing a different md5 checksum on ROM0, the other cameras had perfect checksums.